When Jamie spotted a For Rent sign in the yard of a nearby house that she thought belonged to a friend in her Louisville, Kentucky, neighborhood, she called the number, expecting to reach her girlfriend. Instead, Matt answered. He owned the home, which he intended to rent while spending the next two years working in Cambodia, where he would help a physician friend establish the financial structure for a new children’s hospital. The accountant, however, had not counted on meeting his future wife in November of 2009, and in February of 2010, he cancelled his plans to leave. Although Jamie told Matt not to forgo the opportunity overseas, he was convinced that he was never intended to go anywhere: the For Rent sign was simply a means for them to meet. In May of 2011, he took Jamie to Destin and made a romantic proposal on a boat at sunset. “When I told him that it didn’t matter if we got married in six months or six years, he jumped on six months,” says Jamie. Their wedding date would be November 11, 2011. A small beach wedding in Seaside, Florida, would be the wedding venue because of family ties to the area and the fact that Seaside’s quaint cottages and village shops also reminded the couple of their Louisville neighborhood. Most of all, they envisioned a ceremony in the sand, and Jamie even chose her dress with a vision of how it would flow in the breezes by the water. When their wedding day dawned, however, Mother Nature presented a special gift: the sun shined and the temperatures climbed to the upper 60s. 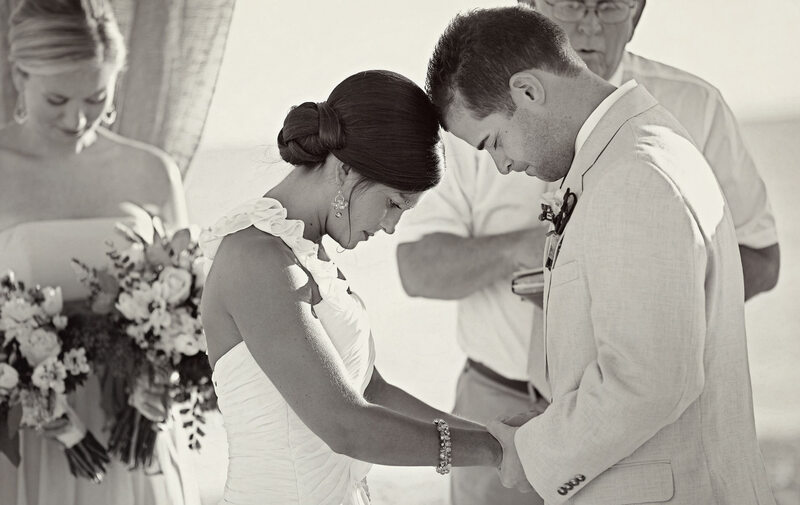 Jamie and Matt treasure every moment of their wedding, but they most cherish their ceremony by the shore.